Calendar years may be largely arbitrary deadlines, but arbitrary deadlines can be a boon to creativity. 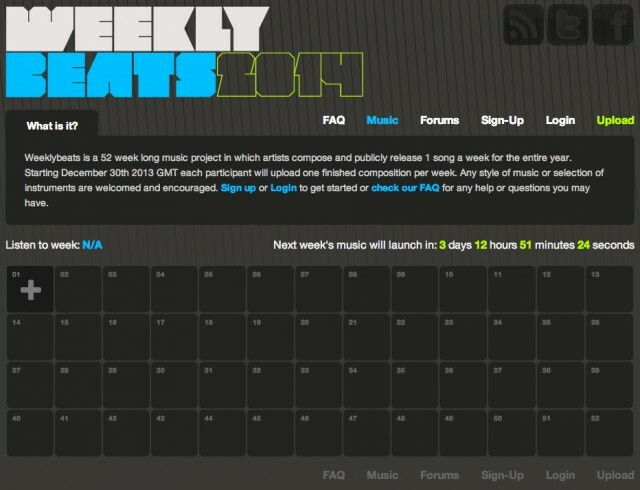 Online community Weekly Beats is again launching a project for producers that invites them to upload new music tracks every week for the year. By the end of 2014, it means each artist may have released as many as 52 tracks, ranging between about one and fifteen minutes. The weekly goal seems a nice one, too: daily goals are fairly punishing, but doing one a week is enough to keep up some consistency. If you want to join Weekly Beats, there’s still time to get into the first week’s batch. Tracks uploaded there carry a Creative Commons license of your choice, or can retain traditional copyright protection licensing. What methods for creative discipline might you use? Sound off in comments; we’d love other ideas and New Year’s Resolutions. And because we do music for love, this might be a revolution you’d keep.